Garbha Sriman malayalam movie directed by Anil Gopinath will have National award winner Suraj Venjaramoodu and Gowri Krishna in lead roles. The movie through the course of time will displays the story of a male who became pregnant. Siddhique, Kalabhavan Shajon, Irshad, Krishnaprabha and Bindu Murali will give life to other prominent characters. The movie is produced by T. S Jayakumar and K. J Rajendran under the banner of G. K Productions. The screenplay and dialogues are written by Suvachan. After gifting bizarre titles, it is entry of unusual and bold stories in the malayalam cinema world. Male pregnancy is not a big news as we have witnessed and heard it many times. But now cinematographer Anil Gopinath is ready with his directorial debut which tells the tale of a man who got pregnant. Titled 'Garbha Sriman', the movie inspired by mythological story revolves around Sudheendran who comes from an ordinary family. 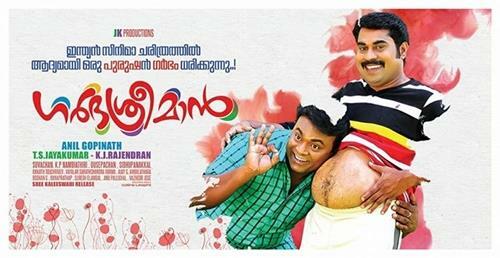 Suraj Venjaramoodu gives life to the title character. Sudheendran (Suraj Venjaramoodu) is the owner of 'Super Fast', a courier service. He lives with his family consisting of his mother and 2 sisters. Gopalakrishnan (Kalabhavan Shajohn) is the close aid and friend of Sudheendran. Along with financial constraints, his courier service couldn't bring him much return. So he decided to think new ways to solve his problems. During the time Gopalakrishnan comes with a novel idea to make him free from the dilemma. To the surprise the advice was to get pregnant. Dr Roy Mathew, a researcher in gynecology who has experimented and successfully accomplished in making pregnancy in male rabbits and monkeys was consulted. Dr Roy Mathew who believed that he could successfully create a male pregnant was waiting for such a person while Goplakrishnan brought Sudheeran before him. With half mind Sudheeran nodded his head for the experimentation as he was sure that it would be failure. But for his surprise, Dr. Roy succeeded in his test and Sudheeran becomes pregnant. The following incidents creamed with humour forms the crux of the movie. Anil Gopinath who has an experience staying behind the camera for 25 years, has high expectations about his entertain the audience with 'Garbha Sriman', which would keep the family audience intact. Krishna Gayathri, the heroine who has changed her screen name to Gowri Krisha has an outstanding track record of winning lot of prizes in speech, monoact, skit and ottamthullal. Apart from acting in a tele serial, she has also anchored a programme in Kairali channel. She is also performing a character role in the serial Amma which is being telecast in Asianet. Gowri plays the role of Malavika, the lover of Sudheendran. Shanavas gives life to Rt. School teacher Shekaran Nair, father of Malavika while Saikumar dons the role of Dr Ravishankar. Siddhique, Irshad, Krishnaprabha, Bindu Murali Shaju, Kochu Preman, Dinesh Panikar, Jayakrishnan, Jagadeesh Prasad, Vanjiyoor Praveenkumar, Tirumala Chandran, Ababil, Anilkumar, Shamili, Jeeja Surendran, Amal, Arun Sidharthan will give life to other prominent characters. The movie is produced by T. S Jayakumar and K. J Rajendran under the banner of G. K Productions. For the lines of Vayalar Sarath Chandravarma, the tunes are set by Ousepachan. The screenplay and dialogues are written by Suvachan. The camera is helmed by K. P Nampyathiri.